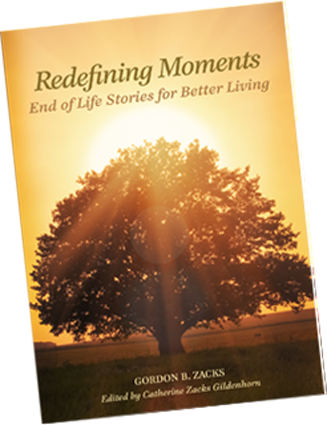 Catherine Zacks Gildenhorn is the editor-in-chief of Redefining Moments: End of Life Stories for Better Living, by her late father, Gordon B. Zacks. She lives in Bethesda, Maryland. Q: How did your father hope this book would help other people facing the end of their lives? A: In December , my father received news from the doctor that he had weeks to live. The prostate cancer that had been managed for several years had misbehaved and migrated to his liver. It’s a lot to process. He viewed the end of life as an opportunity to celebrate life and continue. He had always lived purposefully and lovingly, and this was an extension of that. His first book, Defining Moments, about leadership, spawned leadership societies and became a cult classic. He had collaborators on that [book]. We hosted celebrations of life at our house, to share stories, love, and laughter. Besides that, he viewed the end of life as an opportunity to write a second book, in 30 days. His collaborator and graphic artist dropped everything and came to Columbus, Ohio. I went to Ohio. This is his heart and soul. We are his editors and collaborators, but this is Dad, through and through. I was very close to my father. This experience, then and now, has kept me so busy living, I had no time to get paralyzed by grief and sadness. Like his first book, this is not for profit. The proceeds are donated to charity. There’s a beautiful website, redefiningmoments.org, for people to join the conversation about living and loving and enjoying every moment. Q: Do you think writing the book helped your father deal with his own mortality? A: Yes, on some level, but Dad had an exceptionally positive spirit. He was one of the few people I can think of with a singular purpose in life, and that was the rebirth of the land and the redemption of the people of Israel. He was…very charismatic. Q: What lessons did your father pass along to you about celebrating life? A: How important it is to say thank you to people who have really made a difference in your life. To express love, and leave nothing left unsaid. To tell your kids, “I love you” every night. To be open to experiencing your connections. I have been honored to be the MC for many of these [celebration of life] events; it’s like being charged as a navigator. The MC sets the tone: To the extent to which you can, be honest and truthful, loving and kind. [That] invites the audience to follow suit. Q: How was the book's title selected? A: It picked itself. The first book was Defining Moments. Redefining Moments was just a natural extension of who Dad is and his life’s journey. Q: What has the response been to the book? A: So far it’s wonderful, but it’s only been out since July. I’m my own spokesperson and PR agent. I’m waiting until some of the book fairs, [and] this summer I filmed a guest appearance with Deepak Chopra [which] comes out October 10….My goal is to start a conversation. The book is seed material for the website. --Interview with Deborah Kalb. 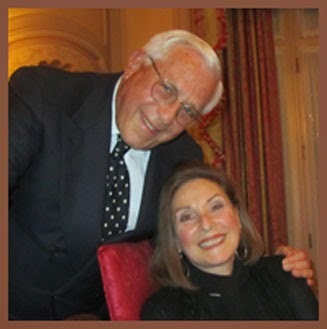 Catherine Zacks Gildenhorn will be participating in the Hyman S. and Freda Bernstein Jewish Literary Festival at the Washington DCJCC, which runs from October 19-29, 2014.